The future of the Italian peninsula was shaped by the different peoples who inhabited it between the years 800 and 200 BC. These include the Etruscans, Greeks and the many Italian tribes such as the Latins, Campanians, Samnites, Sabines, etc. Such tribes had spread out much earlier into Europe from the east and southeast both as invaders and, more gradually, as farmers, giving up hunting and gathering for the more efficient process of tilling the soil. In the process they developed towns, government and written language. This slow diffusion started before 6,000 BC. By 1000 BC most of the peoples in Italy were “Indo-European,” a term that declares common origin (at least 10,000 years ago) of people as different as Swedes and Iranians or Punjabis and Spaniards. Work in both linguistics and molecular genetics supports this idea of common Indo-European origin. In Italy this meant that the speakers of Latin (hence “Lazio,” the area around Rome) spoke a language like Oscan, the language of their neighbors the Sabines, Samnites and Campanians (Naples is in “Campania”). Though no modern descendant of Oscan exists, it was to Latin as, say, modern Italian is to Spanish. An additional sister language of Latin was Umbrian, spoken by inhabitants of central Italy. With that brief introduction, here then is a cast of some of the peoples who made Italy. •The Etruscans. Having mentioned “Indo-European” it is noteworthy that this truly great ancient culture was not Indo-European. Their language (written in an alphabet borrowed from the Greeks) has never been deciphered. At one time, scholars thought they might have arrived in Italy long enough ago to be called “indigenous” — perhaps descendants of the stone-age cave painters of 20,000 years ago. Recent thought, however, places them much later. They may have arrived in the 9th century BC from Lydia, the area of the mainland opposite the Greek island of Samos. In any event, they built the first true towns in Italy. The Etruscans were a loose federation centered in what is now Tuscany. At one time, the Etruscans ruled the Romans; that ended in 509 BC when the Romans overthrew the Etruscan King, Tarquin, and declared itself a Republic. The Etruscans made their last bid for historical permanence a few years later at the battle of Cuma against the Greeks. They lost. Then, in 396 BC the Etruscan city of Veil fell to a Roman siege and the Etruscans were assimilated. •The Greeks. Between 800 and 500 BC the peoples of the Aegean peninsula and archipelago colonized portions of Sicily and the southern Italian peninsula. Those settlements made up “Magna Grecia” — Greater Greece. There arose in Italy centers of Hellenic culture, marketplaces for the ideas of Archimedes, Pythagoras and Plato, ideas that so influenced later Roman conquerors that today most Europeans regard themselves as inheritors of a wondrous hybrid culture called 'Greco-Roman'. In 750 BC Greeks founded the first colony of Magna Grecia, Pithecusae, on the island of Ischia. There followed Cuma on the nearby mainland and Syracuse in Sicily, which became one of the great cities in the ancient Greek world. Naples, itself, was founded as 'Parthenope' in the 6th century BC. It was rebuilt somewhat inland a few years later and called New City, Neapolis — Naples. Magna Grecia suffered from fragmentation and was not a single entity. The settlements of Greater Greece were independent and spent much of their time fighting each other. They never managed to unite against their true enemies: Carthage and Rome. By the 4th century BC. Sicily had become so powerful that its ruler, Dionysus, tried to establish a single Empire of Magna Grecia. He couldn't, however, fend off the increasingly belligerent Romans, who took Taranto in 272 BC, putting an end to Magna Grecia. •Other peoples lived along the Tiber river; among these were, of course, the Latini. There is confusing historical overlap of Latini and Romans. Traditionally, Rome is said to have been founded in 753 by descendants of Aeneas, a refugee from the Trojan War. Well before Vergil’s treatment of this legend, the Romans regarded Aeneas as the founder of their race, the one who succeeded Latinus, king of the local tribe, and whose descendant, Romulus, founded Rome. Archaeology places Latini culture as early as 1100 BC. True imperial expansion of Rome starts in 295 BC when the Romans, at the Battle of Sentium (near modern Ancona), put an end to the competition in Italy by defeating a combined force of Samnites and Etruscans. •The Siculians inhabited Sicily, migrating there from Campania. 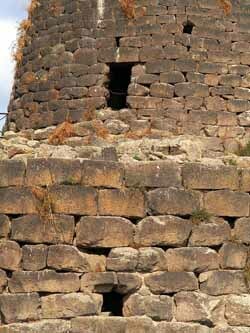 Remains from 1000 BC have been found that show the influence of the earlier great Mycenaean culture of Crete. The Greeks later wrote that they had received land from the Siculian King, Hyblon, to build a city. The ancient peoples of Sicily were assimilated into Magna Grecia. •The Enotrians inhabited the Ionian and Tyrrhenian coasts. The Greeks, upon their arrival in Italy, regarded the Enotrians almost mythically, holding them to be descended from the ancient pastoral people of Arcadia. Tradition spoke of the first great Enotrian King, Italos, who organized their culture in the middle of the second millennium BC. (Somehow, the name “Italos” stuck! )* By the sixth century BC the Enotrians had merged with the history of Magna Grecia. •The Po river runs through the plain of north-central Italy. This area was home to the Ligurians. There are remains from as early as 1300 BC. The Ligurians dealt not only with the Etruscans to the West and Veneti to the east, but even with northern peoples from beyond the Alps. •The area around Venice was thriving well before the founding of the famous city (a “recent” event — the 5th century AD!). As early as 1000 BC a people lived there whom we call Veneti. The Greeks wrote of them, and the early Venetians seem to have been traders much like their descendants, trading glass, amber and ceramic items along the Adriatic coast. They traded with the Etruscans to the west and adopted the alphabet from them. They also traded north of the Alps, where they acquired horses. There, that’s some of them. I realize that my treatment of Indo-European diffusion is a hasty synthesis of competing theories. Also, I did not deal with the important, but brief, incursions into Italy by Carthage and by the Celts. Lastly, remember that there were countless small tribes, Indo-European and non, historic and pre-, who simply came and went unnoticed. There’s a bit of cave-painter in a lot of us.